If you are a senior, odds are you have heard of shingles. Perhaps a friend or family member has suffered this painful, blistering rash – about 50% of those affected are over age 60. Luckily, we have a vaccine to help us avoid developing shingles. Shingles (Herpes Zoster) is caused by reactivation of the varicella zoster virus, which causes the chicken pox that many of us had as children. You may feel unwell, or have some itching or tingling of the skin before a rash of open, oozing blisters emerges, often along one side of the torso or more rarely, on the face – this requires immediate medical attention, since your eyes can be irreversibly damaged if they are affected. The rash lasts for 10-15 days. Why get vaccinated for shingles? The vaccine is generally recommended for people over age 60, or after age 50 for some individuals, as your physician recommends. The risk of shingles is increased in people with illnesses that interfere with immune system function, such as some cancers, and human immunodeficiency virus (HIV), and in those who are taking medications that suppress the immune system (e.g. steroids). Being under a lot of stress can also trigger shingles. Shingles can have several potentially serious complications. Post-herpetic neuralgia (PHN) is the most common and the risk for PHN increases as we age, affected one of every six people over 60 who get shingles. This involves persistent, chronic nerve pain in the areas originally affected, long after the blisters disappear. PHN can have severe effects on quality of life and can be difficult to treat. How will being vaccinated help? The Shingles vaccine currently available reduces your risk of getting shingles by 50%, and helps reduce symptom severity if you do develop it. Having the shingles vaccine also reduces your risk of complications like post herpetic neuralgia (PHN) by two-thirds. If taken early in the course of the illness, treatment with antiviral medications may reduce lessen the length and severity of shingles, and reduce the risk of developing PHN. 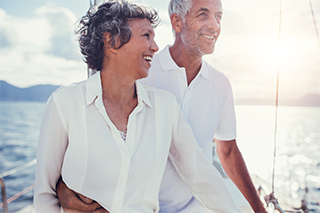 You can have the shingles vaccine when you receive the pneumococcal vaccine to protect you against some forms of pneumonia, which is a concern for many seniors, especially those living in a retirement residence. Talk to your doctor about what immunizations you may need, and visit Vaccines411.ca for vaccine information and to find the vaccinating clinic nearest you.